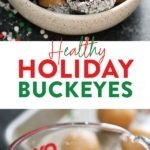 This healthy holiday buckeye recipe is a delicious addition to any holiday baking extravaganza. 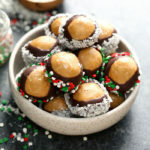 Made with peanut butter and protein powder, this buckeye recipe is a great healthy alternative to traditional buckeyes. 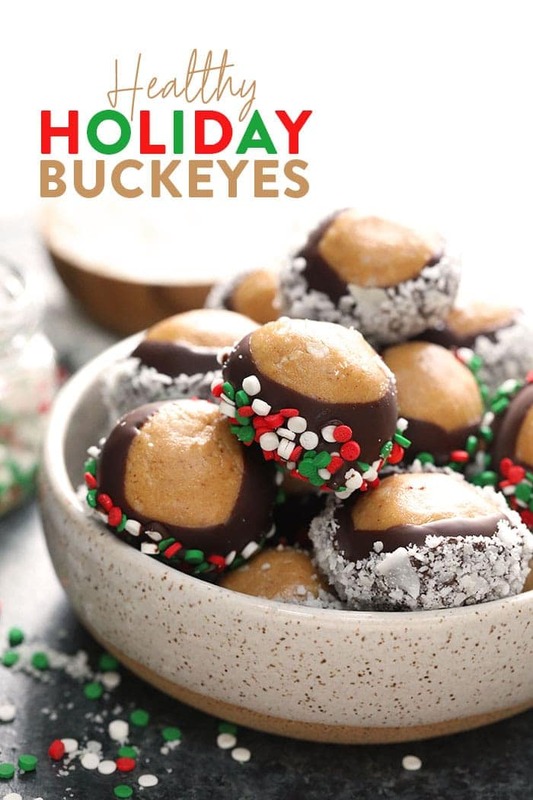 Whip up a batch of these healthy buckeyes to share with family and friends this holiday season! It’s finally that time of the year again! 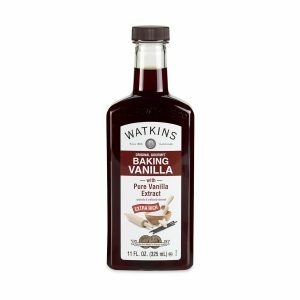 Time to get your holiday baking on, everyone. 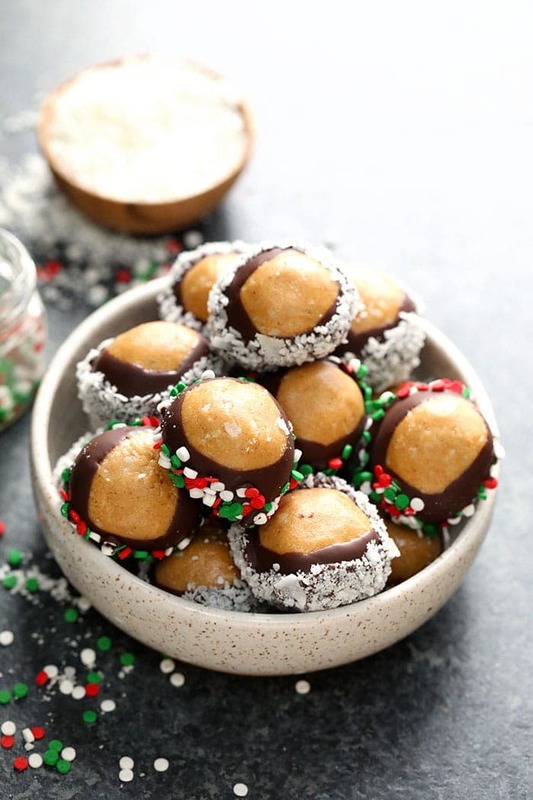 And nothing’s more fun than this healthy holiday buckeye recipe with cutie pie peanut butter protein buckeyes dipped in dark chocolate and fun holiday sprinkles. 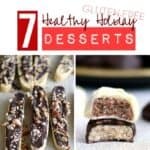 We’ve been loving Perfect Bars for a while now here at Fit Foodie, and this buckeye recipe tastes JUST LIKE the peanut butter coconut Perfect Bar. SO delicious. 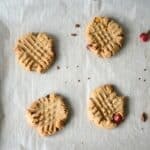 We used a combination of vanilla protein powder + drippy peanut butter + shredded coconut + a little maple, vanilla extract and cinnamon to create the most delicious (and not too sweet!) buckeye. Seriously can’t get enough of these. Speaking of protein powder…have you see our protein powder review? We’ve shared our favorite whey protein powder and plant based protein powder in case you’re in the market to try something new! Happy holiday treat making, my friends! First, cover a baking sheet or plate that will fit into your freezer with parchment paper and set aside. Next, combine all ingredients for the Buckeyes into a medium-sized bowl. Mix until all ingredients are combined. Using a 1 tablespoon measuring spoon, scoop dough into your hand. Roll into a ball and place on parchment paper. Repeat. Place baking sheet in the freezer for about 20 minutes, or long enough for the balls to settle and firm up a bit. While your balls are chilling. Place chocolate chips in a small bowl. You want it to be big enough to fit the chocolate chips, but small enough so that you can dip the balls. Microwave for about 60-90 seconds, stirring every once in a while. Then, add in coconut oil and stir again. 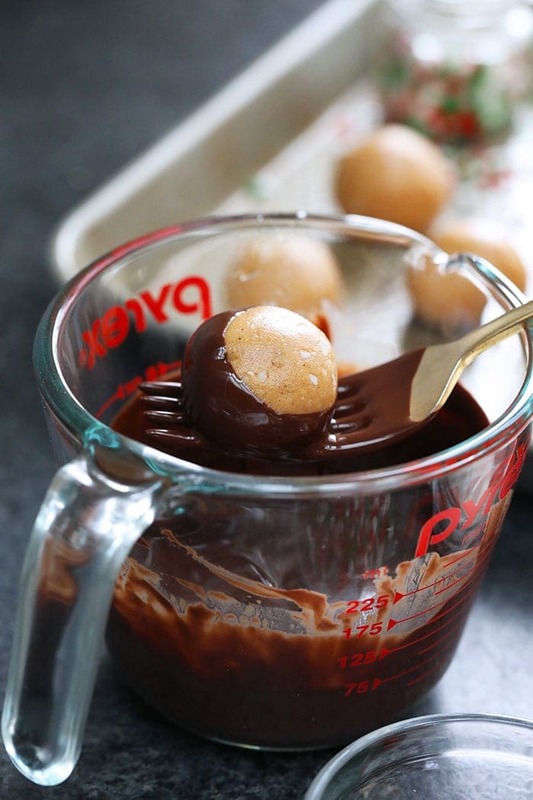 Once your balls have firmed up, it’s time to dip them into the melted chocolate! Place a ball on the end of a fork. 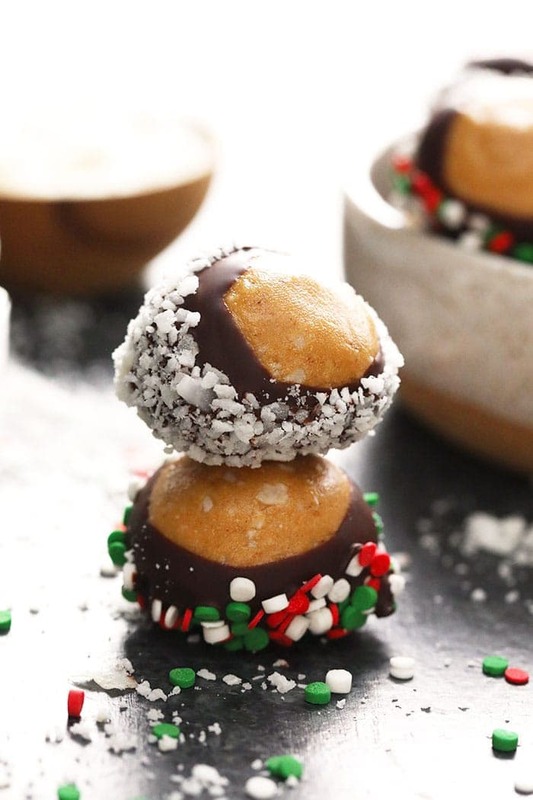 Dip peanut butter ball into chocolate, leaving a ring at the top. Hold your fork with one hand and use your other hand to tap your wrist, so that any extra chocolate drips off. Finally, use a toothpick to slide the ball off the fork and into one of the toppings. 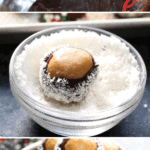 Roll in shredded coconut or sprinkles and then place on parchment paper. Repeat. Place baking sheet or plate back into the freezer for around an hour to completely firm up the chocolate. 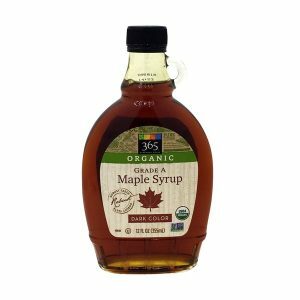 *Depending on how sweet your protein powder is, you may need to add a little bit more maple syrup. 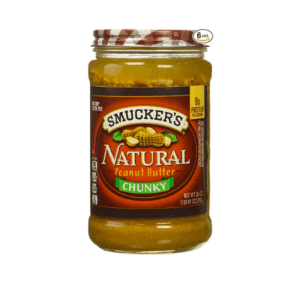 I suggest adding up to 1 tablespoon more. 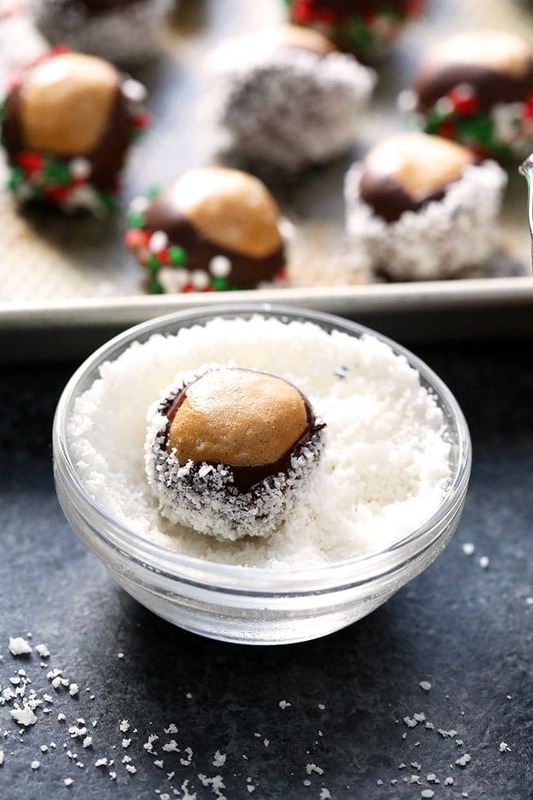 Storage: we recommend storing these Buckeyes in the fridge or freezer in an air-tight container. Because coconut oil is used in the chocolate, you risk melting if your house gets too warm. Protein Powder: We suggest using a whey protein powder or plant-based protein powder. 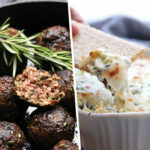 The sweeter your protein powder is, the sweeter these balls will be. 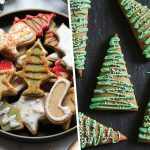 50 Healthiest and Most Delicious Holiday Cookie Recipes!